For those that follow the blog via their reader, you might miss the sidebar posting for the 'Author Events & Interviews' so this week I am doing a quick recap of some of the great guests that are dropping by over the next few months. As I firm up dates, I add them to the sidebar so remember to check in for updates. September 30 - Author Jaime Rush (aka Tina Wainscott) will be visiting to talk about Out of the Darkness, the second book in her Offspring series. 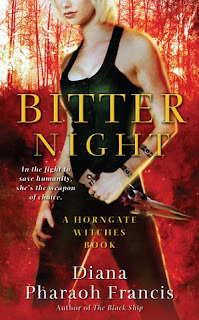 October 21 - I will be interviewing author Diana Pharaoh Francis about her new urban fantasy Bitter Night: A Horngate Witches Book. Tynga’s Urban Fantasy Reviews is giving away a copy of THE VAMPIRE'S SEDUCTION by Raven Hart. Contest runs until August 15. A copy of WINGS by Aprilynne Pike. My Blog 2.0 recaps and links to a slew of terrific contests. Two interviews and book giveaways from Jeri Smith-Ready. Vampire Wire has a contest for one set of Mike Carey's Felix Castor series: Vicious Circle, The Devil You Know, Dead Man's Boots and five copies of Dead Man's Boots. Diana Rowland says the third Demon series book is going to be called PROMISE OF THE DEMON. 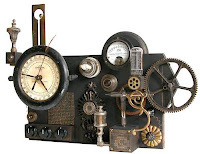 The Romance Book Wyrm by Amy has a great overview of the increasingly popular steampunlk genre in her post Steampunk Obsession. Literary Escapism has more news, interviews and contests here. Suvudu has posted more free books in their free library including DARK FEVER by Karen Marie Moning. Orbit Books has been running an event on their website to come up with the worst SF&F book cover ever. First they asked their readers to first come up with titles for the Worst Book Cover and they received 350 suggestions. Orbit has picked the final list which has gone to poll for final selection. Orbit's US art director will then "create" the cover. Here are the 5 finalists for worst book title for worst cover. They all seem terribly terrible which I guess means that they are good. C.T.Adams & Cathy Clamp will be hosting an exclusive interview with Laurell K. Hamilton on Monday, July 27th. She will be talking about some of her favorite things and give some insight into how she creates the Anita Blake books. 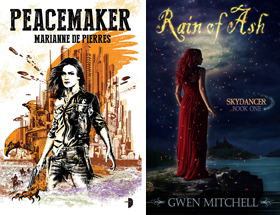 Yasmine Galenorn has launched a special blog dedicated to the D'Artigo Sisters characters from her Sisters of the Moon series. Jaye Wells reveals that THE MAGE IN BLACK, the sequel to RED-HEADED STEPCHILD has an official release date of April 1, 2010. She also has a prequel story in THE MAMMOTH BOOK OF VAMPIRE ROMANCE 2 called “Vampsploitation” which also sets up some back story for THE MAGE IN BLACK. Book three in the series is tentatively titled GREEN-EYED DEMON. The Laurell K. Hamilton website has a new look. Jennifer Rardin is celebrating the new mass market release of ANOTHER ONE BITES THE DUST releasing August 1 with, an installment story - The Daemon Wars: May’s Training Day. This one features Granny May (before she ever dreamed of grandkids, or even motherhood) and the demon G’onasc. Part 1 | Part 2 | Part 3. Justine Larbalestier talks about the controversy surrounding the book cover of her latest YA book LIAR coming in September. A piece in Publishers Weekly also weighs in on the issue. Wired has a fun article on The Top Ten Things You Don't Know ABout Romance Writers that came out of the recent RWA conference. Episode Two of Project Paranormal takes readers to the heart of the paranormal genre with a behind-the-scenes look at #1 New York Times bestselling author Laurell K. Hamilton. Readers will have the opportunity to hear the genesis of the series from Laurell herself through an in-depth interview, as well as a discussion of her latest bestseller Skin Trade. In addition, interviews with the cover art director behind the many looks of Laurell's novels, as well as her editor, give readers the chance to learn first-hand what makes the Anita Blake series unique, both inside and out. Congratulations to Rachel Vincent whose cover for MY SOUL TO TAKE was featured on the cover of USA today last week in an article about the new Harlequin Teen line of YA books. Here is the original article. 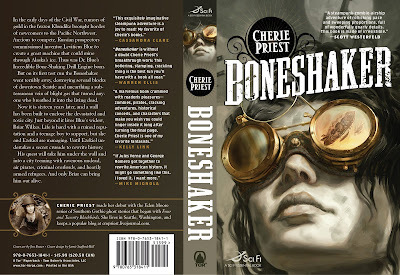 Cherie Priest on the Clockwork Century website has announced that BONESHAKER will be released a month earlier than originally planned and will be available in September. 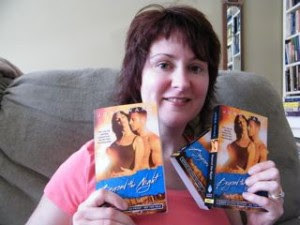 Romance author Tereisa Medeiros has a terrific posting on WHY SHE WRITES ROMANCE NOVELS!!!
. . . which is a total plot based title while still appeasing the PTB's requirements of contrasty words. An interesting article on how "urban fantasy has become the darling of the shelves".- Tor Books Now Offering Urban Fantasy Novels, But They Always Have, Too! A similar piece in The Examiner on paranormal. If you want to weigh in over at Pat's Fantasy Hotlist, he has a post going on about Why Urban Fantasy Probably Doesn't Get.Much Respect... Mostly the same tired old arguments about covers and romance from people that for the most part seem to have only a passing familiarity with the genre but are more than eager to offer their 'opinion'. Ah the blogosphere - gotta love it. Katiebabs from BABBLING ABOUT BOOKS, AND MORE! reflects on Does Winning an Award Really Matter? after her return from the RWA conference. Great stuff! Lori Devoti from Shapeshifter Romance talks about Does Paranormal Romance Rate its own sub-sub-genres? Richelle Mead has posted an excerpt of Chapter 1 of BLOOD PROMISE the next Vampire Academy book. Apparently there are spoilers so reader beware. Vampire Wire is featuring covers for some great books releasing in the next few months. Check them out here. A Dribble of Ink has an update on the casting for HBO's A Song of Ice and Fire by George R.R. Martin. Determined to elude the deadly virus, Danny (LOU TAYLOR PUCCI), his brother Brian (CHRIS PINE), his girlfriend Bobby (PIPER PERABO) and Dannys school friend Kate (EMILY VANCAMP) speed across the Southwestern U.S. to reach a place of possible safety. BABBLING ABOUT BOOKS, AND MORE! has New Moon Movie Clips from Comic Con. The UK hit show Being Human premieres tonight on BBC America at 9:00 p.m. ET/PT featuring a vampire, a werewolf, and a ghost as roomies. This six part series has great writing which reflects the more contemporary interpretation of the supernatural as found in urban fantasy. Not to be missed. 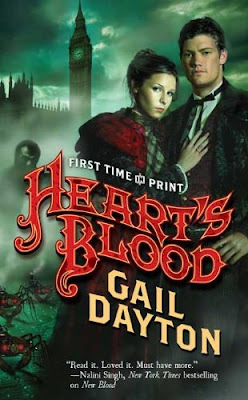 Amy at Romance Book Wyrm shows off the cover for HEART'S BLOOD, Book 2 in the steampunk blood magic universe with a release date of December 29, 2009. Tez Says has cover art for the Thorn Queen (UK, AU) by Richelle Mead. Literary Escapism has a number of new covers including COMING UNDONE by Lauren Dane and THE DEAD-TOSSED WAVES by Carrie Ryan. I'm glad BoneShaker is coming out earlier, I want to read that one. Wish I could afford HBO, I would love to watch Trueblood. Another great weekend report as usual! Off to watch Being Human - have a great week!!! There's alot of good stuff in that post. And thanks for mentioning me! How awesome for Rachel Vincent to have her new book on the cover of the newspaper like that! The Steampunk Anthology looks interesting, I'll have to check that out. And I'm glad that BoneShaker is coming out earlier. Thanks for the shout and linkage. Quite the round up on news, thanks for sharing. After reading about Liar, what the author has been quoted as saying, I'm going to have to check it out, but with trepidation. If what I read is what the author said, it was not a favorable quote. I've read some steampunk, love what I've read, my kids got me interested. I'll be checking back for author interviews, some of my favorites will be here. Yeah, the comments over at Pat's Fantasy Hotlist are a bit....interesting. I always find it odd when people respond on covers or whatnot when they don't read the genre and they always say "I never will". Kind of irritates me. Thanks for the mention. I'm still trying to figure out where you come up with all of this stuff. That Steampunk antho looks like it would be a good starting point for someone unfamiliar with the genre. I'm going to have to check it out. When is it being released? Thanks Mardel. The situation with LIAR is particularly disturbing. As an adult reader obviously I take covers and their connection to the story with a grain of salt but I do believe it is incumbent on publishers to have more truth in advertising for YA. Marketing departments say it may affect sales but do they have the facts to back it up. And if they choose to mislead people by the covers perhaps a warning like on packs of cigarettes is necessary - "WARNING book cover may not reflect contents"
Cybercliper hope you like Being Human. Terrific show. Amy Rachel must be very pleased getting her cover in front of perhaps millions of eyeballs. Very cool. Lots of steampunk coming up PopinFresh. Lots of new names in that anthology. You're always welcome Dottie. I hope to round up even more interesting guest for the fall. Jackie yeah Pat likes to stir things up from time to time. Most of them have the usual LITRA-CHUR bias. God I hope when I was absorbed in SF&F I wasn't like that. As to where I come up with all the stuff, probably same as you, combing through my Google reader subscriptions and Google Alewts mostly. Make it four- Thanks Doug! Caffey mostly because of my readers. Love ya all.